We will Pick you up early in morning from your hotel then drive to Sharm El Sheikh Airport and fly to Cairo. 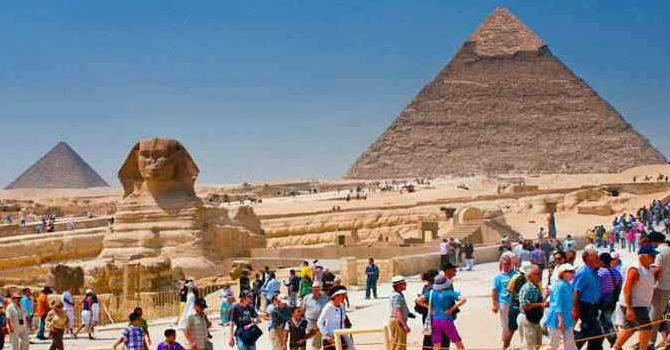 Arrive in Cairo airport and meet your personal Egyptologist guide then transfer to visit the great pyramids of Giza, head to the highest point of Giza plateau to admire the amazing panoramic view of ancient world only remaining wonder. Drive down the plateau fto explore the enigmatic Sphinx and the Valley temple of king Chefern. Get your lunch meal in local restaurant then transfer to the Egyptian Museum, it features around 165,000 Egyptian artifacts covering 5000 years of history and the priceless collection of King Tutankhamun are the highlight along with the Royal Mummies room and the big library. You will enjoy enough free time in each site to explore in leisure. Evening transfer to Cairo airport, fly to Sharm El Sheikh then transfer back to your hotel.